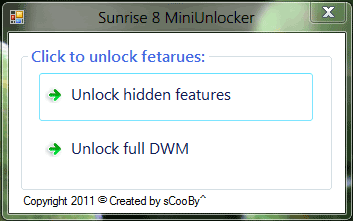 Sunrise 8 MiniUnlocker is a new fully automated unlocker for Windows 8 developed by sCooBy^, one of the first hacker who cracks open the locking mechanism of Windows 8 features in Windows 8 Build 7955. The main difference of Sunrise 8 Unlocker when comparing with BluePill or NoPill is that it skips patching slc.dll or any SPP (Software Protection Platform) related files so that the activated Windows 8 system will continue to be genuine upon validation after unlocking. Any modification or patching to Windows software licensing (SL) and activation related system files will cause Windows to return non-genuine status because the genuine verification calculates the hash checksum of strategic system files against official database. As the result, Microsoft Security Essentials will display error message that this version of Windows is not genuine. Sunrise 8 Unlocker attempts to make activated Windows 8 genuine by not touching slc.dll and other licensing related files, which initially released as “red pill” hack. Instead, it modifies other files instead such as authui.dll and shell32.dll.mui, and redirects them to make the call to a patched slx.dll instead. Sunrise 8 MiniUnlocker is said to be stable, and works to unlock all features that came with Windows 8 Build 7955, similar to other “red pill” solutions, which includes Ribbon Explorer UI, Touch Pattern Login, Enable Full DWM (No blur on Aero), Immersive Browser, Modern Webcam (MoCam), Modern Reader (PDF), Metro UI, and etc. Sunrise 8 Unlocker should be only applied on a clean installation of Windows 8 Build 7955. If you’ve been using other crack, use the following command to repair the system files, or try the remover tool for the unlocker which is used to patch the system to unlock hidden features.